Our experience with a wide range of materials and processes is invaluable in turning concepts into products which are both functional and also aesthetically pleasing. Sophisticated 3D modelling software (Solidworks) ensures that designs can be evaluated at the concept stage. We can use mouldflow analysis to predict the behaviour of plastic in the mould, enabling precise and effective tool design. The data can also be used to generate prototype and pre-production models. We have worked on design projects for sectors as varied as military, agricultural, motorsport and aerospace. Draft: This is a taper applied to the faces of the part at the point of ejection and prevents damage by scraping when the part is ejected. The draft is ideally between 0.5 degrees and 5 degrees. Tolerances: These vary depending on the moulding material so careful consideration should be given to material selection when tight tolerances are required. Wall Thickness: Sink marks and warpage happen when surrounding areas of a thick section cool and solidify quicker than the thicker mass causing non-uniform shrinkage, this can be avoided in part by designing the walls to a uniform thickness and to the correct ratio with adjoining walls or by minimising the thickness of the wall, ribs can be incorporated into the design to maintain strength but rules apply here too. 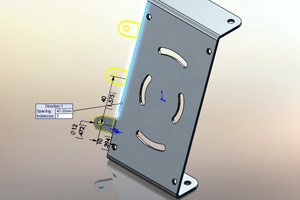 We can accept data from all the major 3D CAD (computer aided design) platforms such as Solidworks, Iges, AutoCAD, ProE, Step and Unigraphics.